WOW what a great start to the new Hop!! Thanks to all the new followers, the wonderful comments and all the great link ups!!! It was nice to see the Field Trip Hop button on so many side bars. Thank you for passing on the word! The first month had 61 link ups and school has not even officially started for most home schoolers. I read some amazing trips and loved the pictures and information that was shared on each linkup. I thought every other month or so I would do a spotlight on one lucky blogger and this month spotlight is Jen at Chestnut Grove Academy. How many children do you have and how long have you home schooled? I have 3 boys. My oldest is soon to be 5, followed by my 2 yo and my 8mo. I consider myself has a homeschooling mom from the start; we all are if you think about it. But I stared forming co-ops about 3years ago and doing more ‘organized’ activities at home. We ‘officially’ started homeschooling this past June as we started Kindergarten with my oldest. Why did you choose to home school? I choose to home school for many reasons. Probably the two reasons most of all are: 1. how children learn (particularly in early childhood) and how they are taught in school are two different ways, and 2. it’s not possible for one teacher to fully accommodate 20+ students, though there are a lot of good teachers out there that give it there all (plus some). What is your philosophy of home schooling? My philosophy of home schooling is to adjust my teaching to that of my children. Make it fun, follow their interests and expound from there. Once we start first grade we will tackle a more classical approach, but even still, I have pieced together lots of different things, and have tried to take a hands on approach to learning. That’s not to say I don’t have to remind myself of that constantly. What is your favorite type of fieldtrip? We like all sorts of field trips, children learn through doing, so we take every opportunity we can to take them out and let them do! I don’t think that all learning needs to be scheduled, so our field trips don’t always coincide with a theme, we just try to find the learning opportunity in all we do and every where we go! 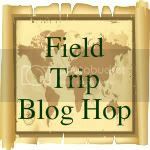 How do you incorporate fieldtrips into learning? I try to match some trips up with what we are ‘learning’ about, but we also seize the opportunity to go anywhere and everywhere we can whenever we can. I try to do at least one ‘adventure’ of some kind or another a week. There are lots, as we’ve only been here 3 months…I look forward to exploring all the many beautiful places here on the islands! We will also be making some inter-island trips; I think I’m most looking forward to taking the kids to see the volcanoes on The Big Island, but that probably won’t be until 2012 or 2013. Why did you choose to blog about your homeschooling? I started blogging sporadically a year ago, just because it sounded like fun. I had gotten a lot of good ideas from other blogs, and thought I could share some ideas as well. I hadn’t messed with it much until we started up our Kindergarten year, a friend of mine’s sister (who also home schools) asked if I had a blog; I took it as a sign to get back on board. So, I started blogging again. I wanted to get my knowledge (I have a MS in Early Childhood Education) and ideas out there to others. Secondly, I wanted to advertise my book business (I have been an Usborne Books and More consultant for almost 5years now). Mostly, I thought it was a great way for my family to see all that my children are accomplishing in home school (many of them are skeptical of it) and give them the ability to stay close when they are so many miles away. There are so many bloggers that are a great inspiration to me, I hope maybe, just maybe I can inspire someone as well. 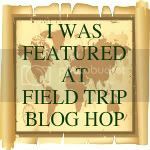 Jen at Chestnut Groove Academy also does a field trip hop on Fridays and it is not just for homeschoolers so go check her site out and link up! Rules remain the same this month, link up any field trip that you and your home school children have taken for the entire month of August:)!!!! See the page at the top for additional guidelines if this is your first visit. Be sure to spread the word about this new Field trip Hop! The more that join in the more wonderful places we can visit! Share your adventures and it may give other homeschoolers an idea of a field trip they can pursue with their children. I just found this! I will be linking up from now on! This looks like fun. I already enjoy reading about your amazing adventures. Thanks for the feature button, I was confused by your comment at first...lol...putting it on my blog now! new follower! great blog, love a follow back.